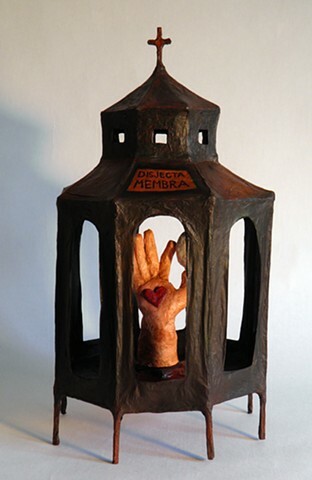 Inspired by the Byzantine Basilica of San Vitale in Ravenna, Italy, this octagonal reliquary houses an ex-voto of a hand, which holds a white egg. A stylized heart marks the palm and suggests the wounds of a stigmatic. The title of the reliquary is derived from Horace's Latin phrase disjecti membra poetae or "limbs of a dismembered poet." The term is often used to refer to ancient pottery fragments or isolated pages of manuscripts: when the separate parts are pieced together, a single source can be identified. DISJECTA MEMBRA attempts to make sense of recent personal experiences in the larger context of my artistic history from ceramic sculptor to current paper reliquary maker.